Home Travel US Virgin Islands: Isn’t It Time You Visited? US Virgin Islands: Isn’t It Time You Visited? Three US Virgin Islands three ways. Whatever your heart desires in the way of an easy Caribbean holiday, the US Virgin Islands has got you covered. Even better, no passport needed and it’s an easy jaunt from most US cities. Indeed, it is still a place that folks love to sail, but you can also rent a car pretty easily and you’re in luck since the locals in the US Virgin Islands drive on the right-hand side of the road, unlike many English-style Caribbean island getaways. 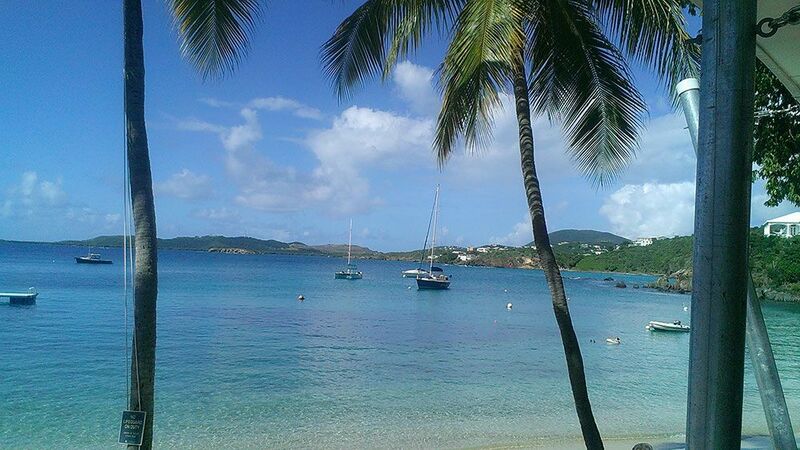 St. John is for nature lovers so think a tranquil and peaceful atmosphere and do plan to spend at least a day. The other two islands, they offer it all from adventure to beach time to fine dining. I began my trip in St. Thomas, which is where your point of entry from the US will most likely be too. I stayed at Secret Harbour Beach Resort and from there spent a few nights exploring and eating my way around the island. Secret Harbour had a beachfront on the eastern end of St Thomas meaning less noise and traffic and more chill time. There is a marine sanctuary to enjoy and lots of palm trees coupled with the Caribbean blue water that you can take advantage of snorkeling, scuba diving or just playing on one of the watersport rentals. Even with all the enticing things to do in St. Thomas, the island has a lot of history too. Be prepared to spend at least one of your mornings on the island discovering the downtown area with stops at the Government House, 99 Steps, Main Street and the Bluebeard Castle Museum. While I bowed out of the zip line experience, my colleague took the challenge at the Tree Limin Extreme while I headed over to the Botanical Gardens at St. Peter Great House. After a few nights on St. Thomas I took the ferry to St. John from the Red Hook Ferry Dock, it just sounds like there is a pirate waiting around the corner. No pirates here though and the 20 minute ferry ride couldn’t have been easier. Once arriving on Cruz Bay there was a driving tour of the island before lunch. It was only a day trip so I had to make it quick, but do take the time to snorkel and hike on the island. Another don’t miss is the Emmaus Moravian Church in Coral Bay. It is on the List of Registered Historic Places in the United States Virgin Islands and was the only church allowed to minister to the slaves. As the sun began to makes it way down the horizon it was time to jump back on the Ferry and head back to Red Hook Ferry dock on St. Thomas – another relaxing day. The next morning it was time for island hopping once again, this time for a few nights on St. Croix. Hopping onboard a local seaplane I arrived in 25 minutes at Christiansted Harbor Seaplane Base before being whisked away to The Palms at Pelican Cove. It is an entirely different vibe on St. Croix and here I first took a driving tour of Frederiksted with a look at the Rain Forest, Mt. Pellier Domino Club, Fort Frederik, Estate Whim Museum and the St. George Botanical Garden before it was time for a Cruzan Rum Distillery jaunt. I have been to enough distilleries so I just wanted to take a drink of that rum – after all, they have been making this juice for the past 300 years so it’s good. In the afternoon a Cruzan Cow Girls horseback ride is recommended to enjoy an island sunset. On the final day it was time to explore the island – adventure style so Tan Tan Tours was the answer for a look around the island on a four-wheeler exploring the back roads and hearing all about the island legends. Of course seafood is an obvious choice for a meal when in the Caribbean, but that is not always the best choice. Here are a few ideas for eating out while in St. Thomas and St. Croix, this little paradise is a hidden for fine dining options. Caribbean Fish Market – An open air restaurant with a calm breeze on the Cowpet Bay, the chefs offer a traditional Caribbean style menu here that won’t disappoint. Glady’s Café – Location, location, location, that’s what I always say. You are going to love this place because it is located in the historic buildings of the Royal Dane Mall. You will find some American menu items thrown in, but try the Caribbean offering instead because it is prepared Glady’s style. Iggies Beach Bar and Grill – Located on popular Bolongo Bay Beach at the Resort of the same name, if you are looking for a tourist hangout you’ve found it here. It is also the only place on St. Thomas where there is continuous live entertainment 365 days a year and a weekly Carnival extravaganza. In short, it is always a good time to be at Iggies. Grand Cru – This is the island’s upscale dining offering with a selection of 23 wines on the menu and some excellent house infused martinis and cocktails. The chef creates Mediterranean cuisine using local ingredients so you will walk away satiated. Jen’s Island Café and Deli – American, Caribbean, breakfast, it all comes together here where you can opt for yogurt with granola or a three cheese omelet. For lunch there is a variety of wraps and even Philly cheesesteak, but save room for one of the homemade desserts. The Galleon – The name sounds impressive and it is since the Galleon sits on the waterfront at Green Cay Marina. It offers a delicious fine dining experience. Seafood, meat and dessert, again with a good wine list from the large wine cellar and a fine dining backdrop. 40 Strand Eatery – This is the perfect little, cozy urban restaurant helmed by chef Todd Manley and Brant Pell. 40 Strand has signature craft cocktails and a wine list that definitely rivals the 48 states. The cuisine is a bit different since the emphasis is on a Danish menu. Kendrick’s – This restaurant emphasizes French cuisine in the perfect location at The Buccaneer. Tutte Bene– The name is Italian of course and it was created by local restaurateur Tony Cerruto. While he no longer owns the place, his name and fine dining ideas live on here.